All transactions are safe and secure with a reliable history in online purchasing behind each of our associates. Buy the Marilyn Headphones t-shirt to own Marilyn Monroe clothing and merchandise. "I used to think as I looked out on the Hollywood night - there must be thousands of girls sitting alone like me, dreaming of becoming a movie star. But I'm not going to worry about them. I'm dreaming the hardest. "...and it showed. All of our Marilyn Monroe shirts are acknowledgments that her dreaming got her somewhere. 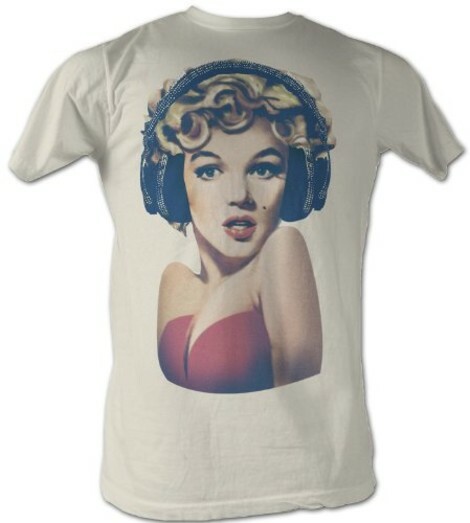 This particular Marilyn tee adds a pop culture twist by putting a pair of headphones on her. If you too have dreamed like Marilyn Monroe, let this fun design be your inspiration. In addition to the Marilyn Headphones tee above, browse the Marilyn Monroe Clothing Gallery for more apparel like men's and women's clothes, kids shirts or hoodies.